Submissions are now open for "soapbox" talks. August’s speaker event is our increasingly annual Soapbox Special. It's that time of year again where we get up onto our soapboxes and wax lyrical about matters that get our skeptical goat. We'll be putting on four short talks with Q&A's. Our August 'speaker' event is our increasingly traditional Soapbox — several short talks on different topics by members of Manchester Skeptics. If you've some bad science you'd like to dissect, unsupported claims to debunk, woolly thinking to criticise or if there's a skeptical campaign you'd like to publicise, then this is your moment in the spotlight. Please send a brief description of your proposed talk to events@gmss.uk by Monday 3rd August. It’s August, which means it’s time for our annual soapbox event! We’ll be giving a platform to 4 or 5 speakers to vent their skeptical spleen or to wax lyrical on their topic of interest.This year we will have Twitter legend Andrew Taylor mounting an attack on prescriptivist linguists. Andrew asserts that this is a whole genre of widely believed but non-evidence-based nonsense that he assures us has yet to be tackled by skeptics. So we may be in for a first here. Also joining us will be Katie Steckles from Manchester Girl Geeks who will be talking about philosophers such as Descartes and Russell, but with a twist. Aside from being philosophers they were also accomplished mathematicians. So come along for some skeptimaths. Head honcho of Skeplit, Joely Black, will be attending skeptical confession, when she discloses her dark past as a tarot reader. 20 renditions of the periodic table and 10 Demon Haunted Worlds for her! We may also be entertained, enthralled and educated by not just one but possibly even two Callisters. Details TBC! Skeptics in the Pub Soapbox! ﻿Huzzah! 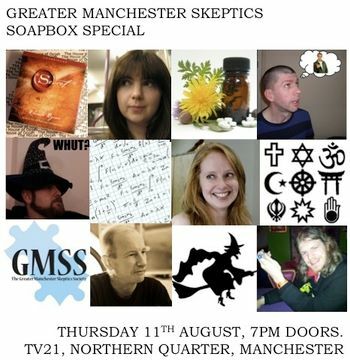 The August Soapbox Special returns to Manchester Skeptics in the Pub! This year we've got six short 'Soapbox' style rants/talks for your enjoyment! If you've never been to a Skeptics event before, this would be a great chance to get a feel for what it's all about. This year we have talks ranging from homeopathy through to witches, stopping off at religion, mathematics, "The Secret" and more....with the talks coming from members of our own skeptical community. Dave Briggs: Homeopathy: the current state of the art. Joely Black: The Secret: How to use one magic word to make millions, get a NYT bestseller and a top-selling movie. Victoria Stiles: How Crazy was the (English) Witch Craze? Inspired by the great Soapbox guests we've had on the Just Skeptics Podcast so far, for August's SitP, we'll be having a special 'Soapbox' edition. There'll be 3-4 mini-rants on diverse topics currently unexplored at our speaker events. This would be the perfect event to bring along skeptical newbies, as there'll be breaks, and a broad range of topics! We'll be treated to the following talks, from regular Just Skeptics soapbox guests Allan and Rick, alongside resident blogger extraordinaire Xtal Dave, and the InKredulous Andy Wilson of the Merseyside Skeptics Society and the 1023 Campaign.